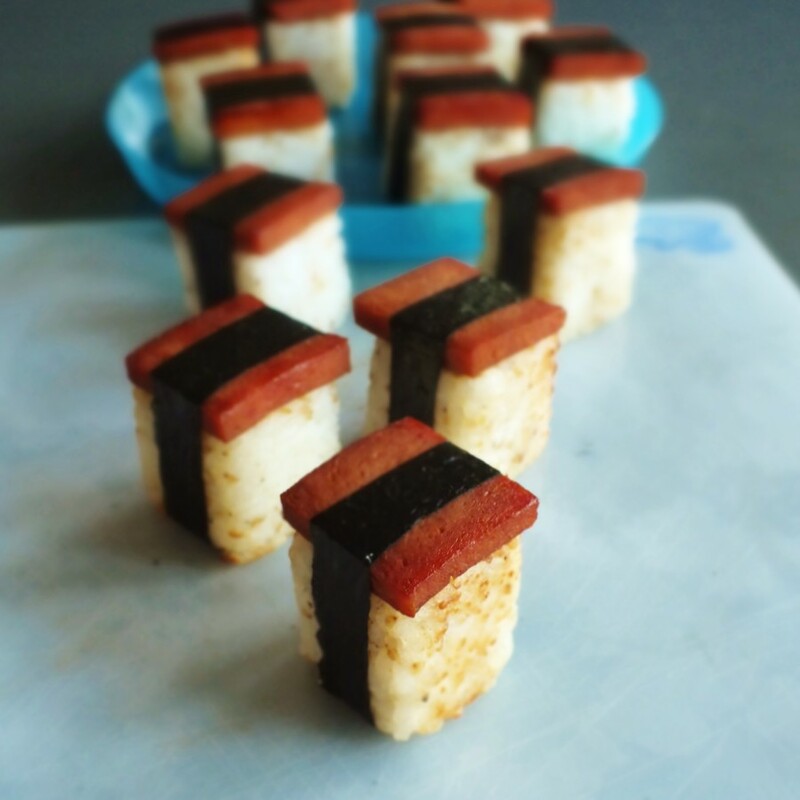 After making and eating spam musubi last week, I began to think of ways to make them more of a bite size appetizer. Then I saw this! And I realized that a cheaper alternative was right within reach–in my freezer! I realized that I didn’t need to buy a fancy rice cube maker, because I already have a fancy ice cube maker! 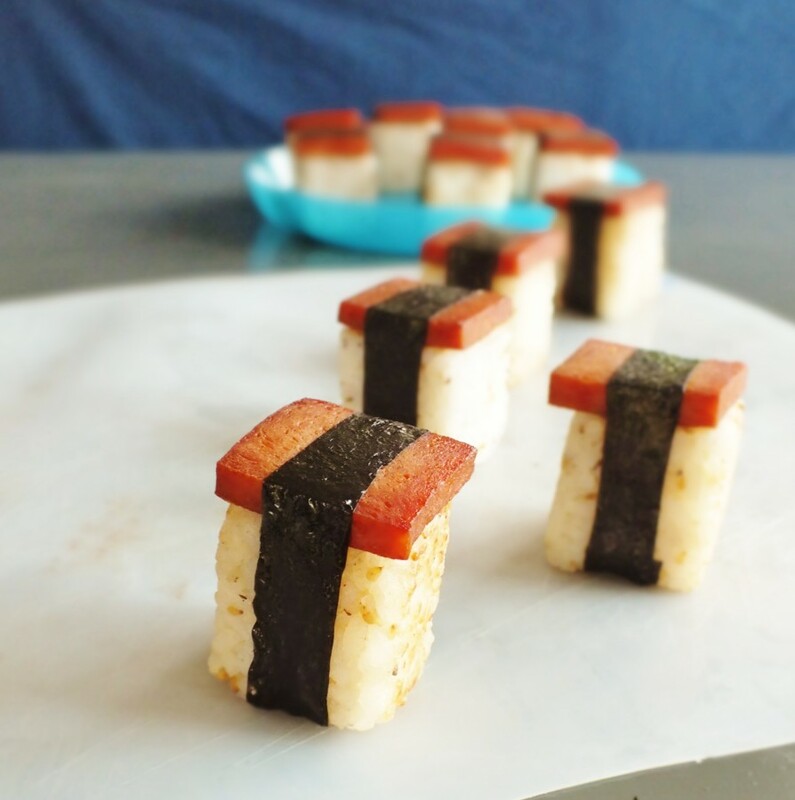 If you have a silicone ice cube tray mold that makes perfect square ice cubes, you can easily make these spam musubi bites. 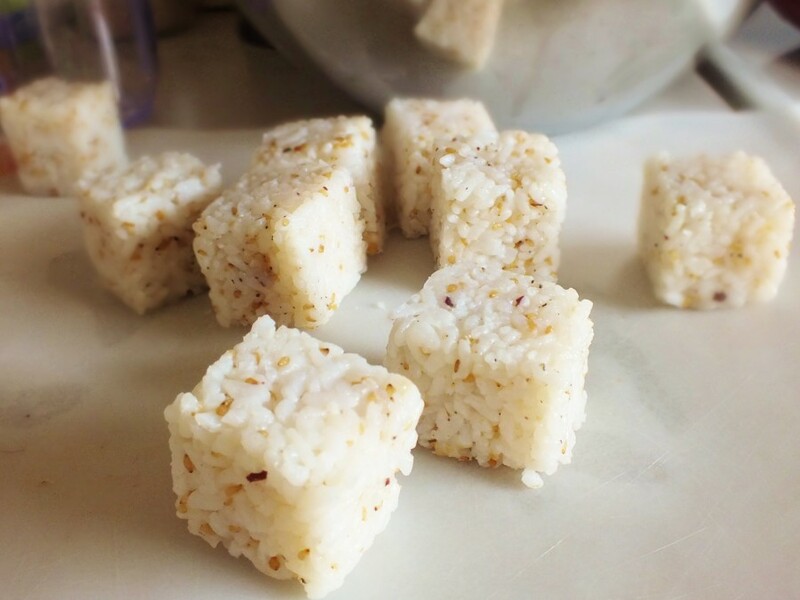 They are actually fairly easy to make, and you would not need to buy a special mold to make the rice cubes. I had a blast making them, then realized I had to wrap them tightly and put them in the fridge, so that they would last, and that I wouldn’t eat them all in one sitting! 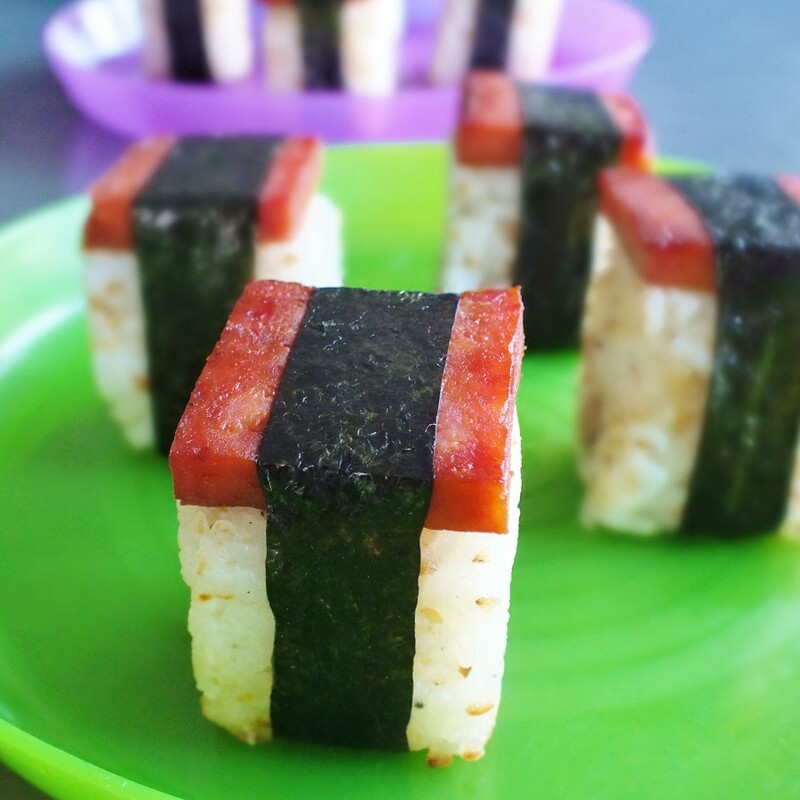 You’ll need to measure the size of the squares in the ice cuber maker to determine how much rice you may need and what size to cut the spam. 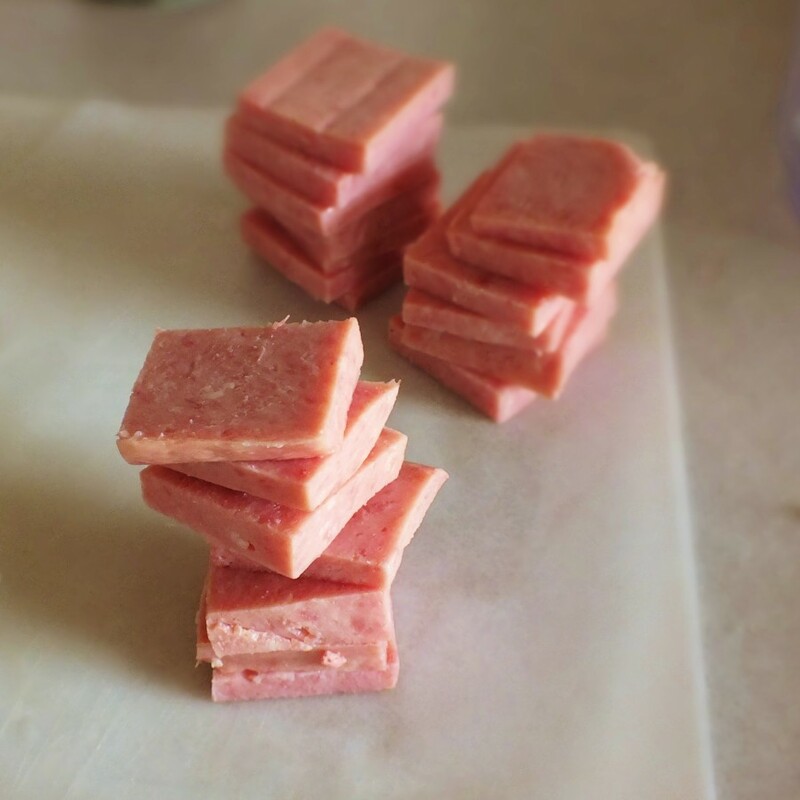 Mine makes 1 and 1/4 inch square cubes, so I cut the spam into 1 and 1/4 square tiles, about 3/16th of an inch thick. My ice cube tray makes 15 cubes, so I only needed 15 spam tiles, and about 3 cups of cooked rice. 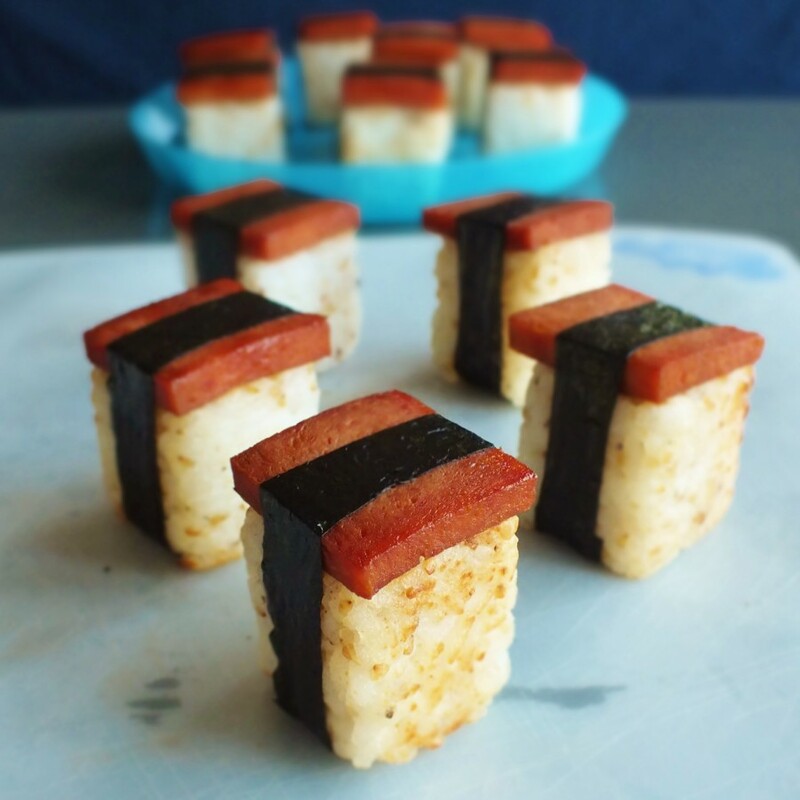 After cutting the spam, place on a small plate or tray with a rim, and pour about 1/4 cup soy sauce over the spam slices. Set aside to marinate while preparing other ingredients. For the rice, combine rice vinegar and sugar first in a small glass or bowl and stir to dissolve before adding to the 3 cups rice. Add the furikake to the rice and mix thoroughly, using a spatula, or extremely clean hands. 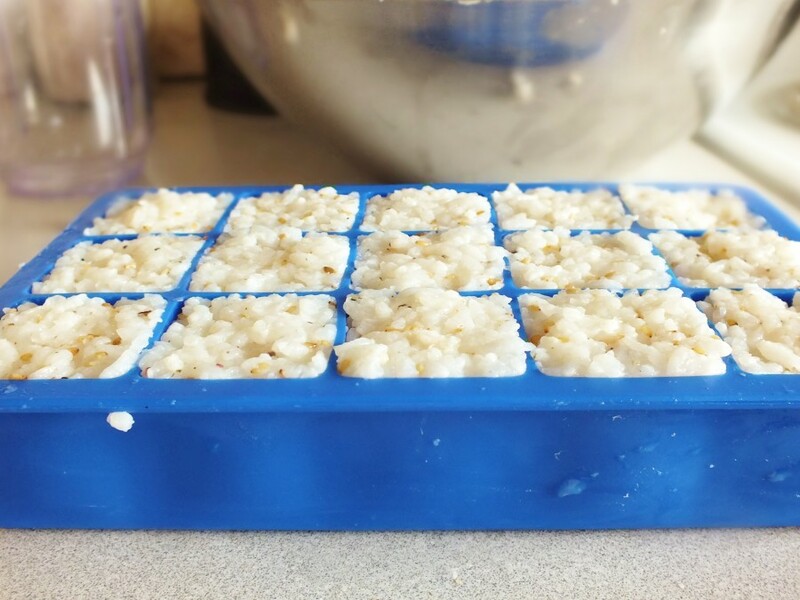 Place rice in each ice cube mold on the tray, pressing down firmly to pack it in. 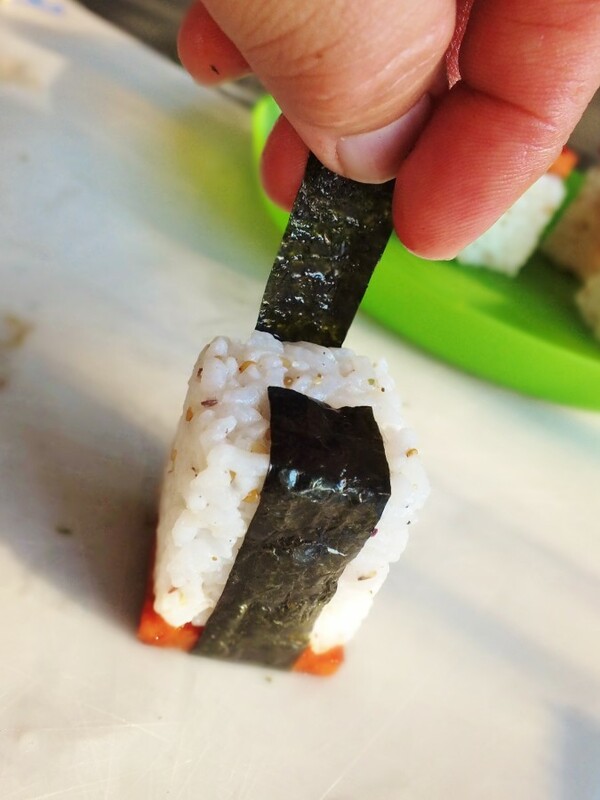 Use a knife to gently go over the top of each cube to remove any excess rice. Unmold on a cutting board by turning tray upside down over the board and gently pressing the bottom of the tray, or gently rocking the tray until the rice cubes loosen and fall. They should be firm enough that they’ll hold their shape, but if some are out of shape, just press back in one of the molds and turn over a board again. Set aside. Add oils to a skillet and stir with a rubber heat-resistant spatula to mix. On medium-high heat, fry rice cubes, keeping track of sides to evenly fry all sides of the rice cubes, turning and adjusting heat as needed. When sufficiently cooked, rice should be crispy on the outside and only slightly browned in areas. Remove to a plate and set aside. To skillet, add spam slices and half of the soy sauce it was marinating in. Add other half of soy sauce after turning over the slices. 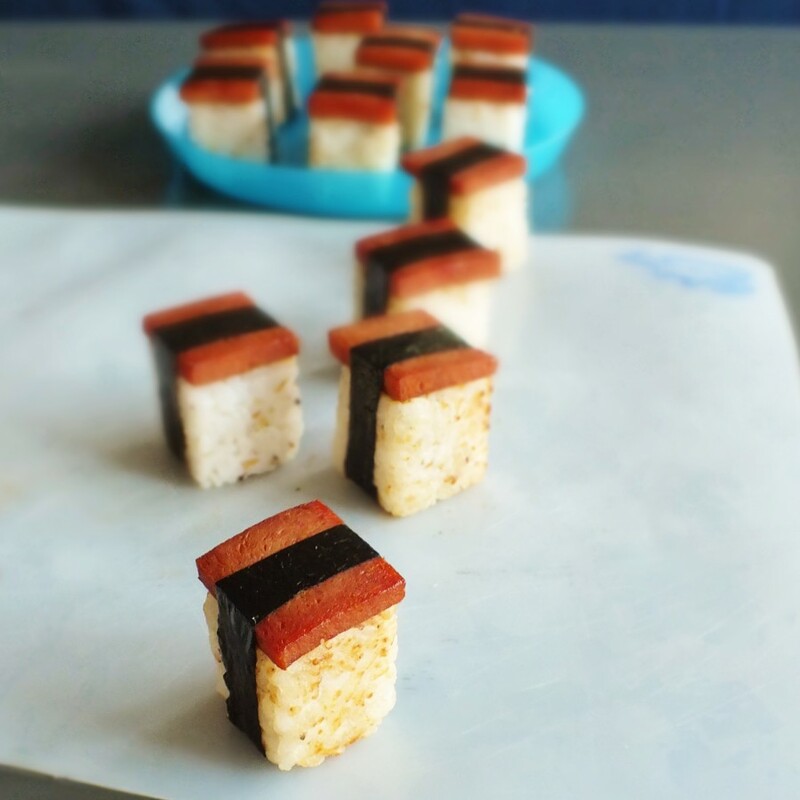 Like the rice cubes, keep track of each spam slice, so that you fry on both sides, until sufficiently browned on both sides but being careful not to burn them. Remove from heat and set aside. In a small bowl or cup, combine corn syrup and water and stir to combine to mix thoroughly. Set aside. 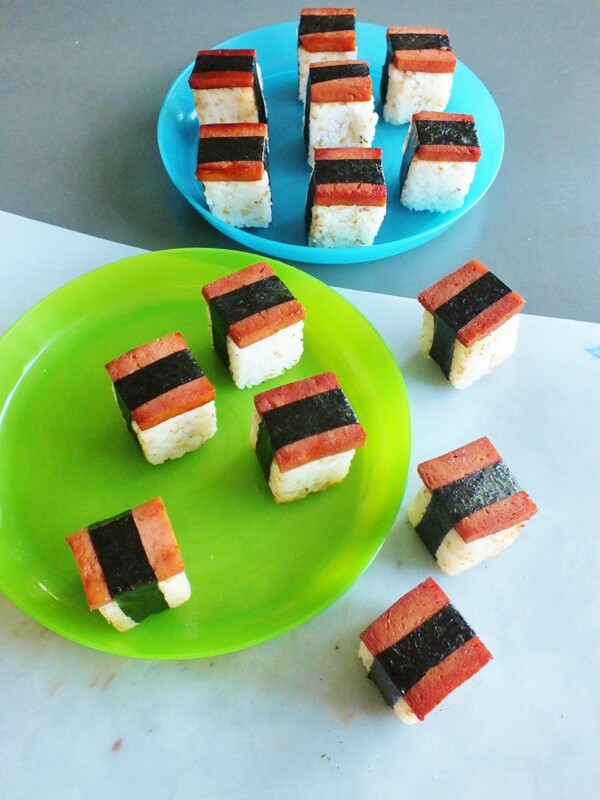 Cut sushi nori sheet into strips, starting horizontally from the top or the bottom, anabout 1/2-inch wide. I only needed 15 strips, so I just needed one sheet of nori, but how much you may need depends on the size of your nori sheets. 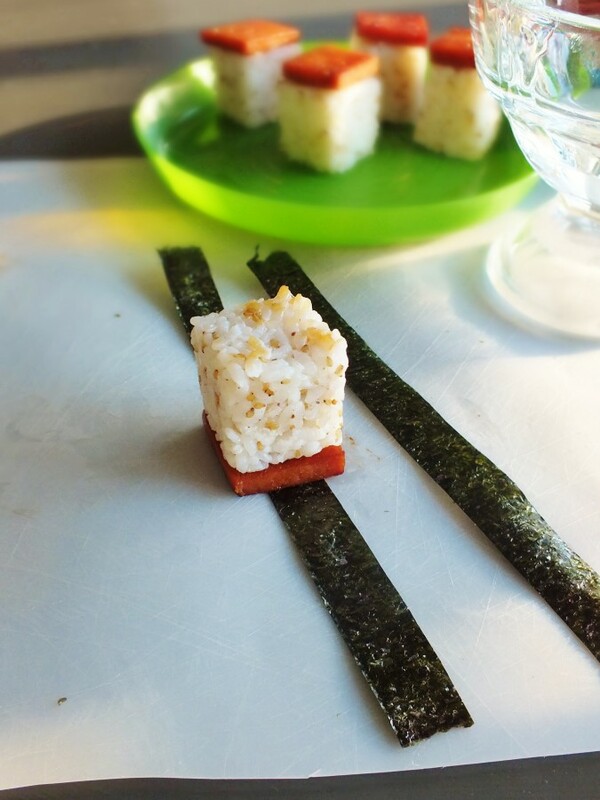 For each strip of nori, place one spam slice directly over the middle of the strip of nori, and one cube of rice over the spam slice. Moisten the strip of nori by dipping your finger into the water/corn syrup mixture and rubbing the nori on each side of the spam and rice, then folding the nori over to the top of each rice cube, using the scissors so that they do not go over to the side, and tuck both sides at the top to what will be the bottom of the rice cube. (see above photos). 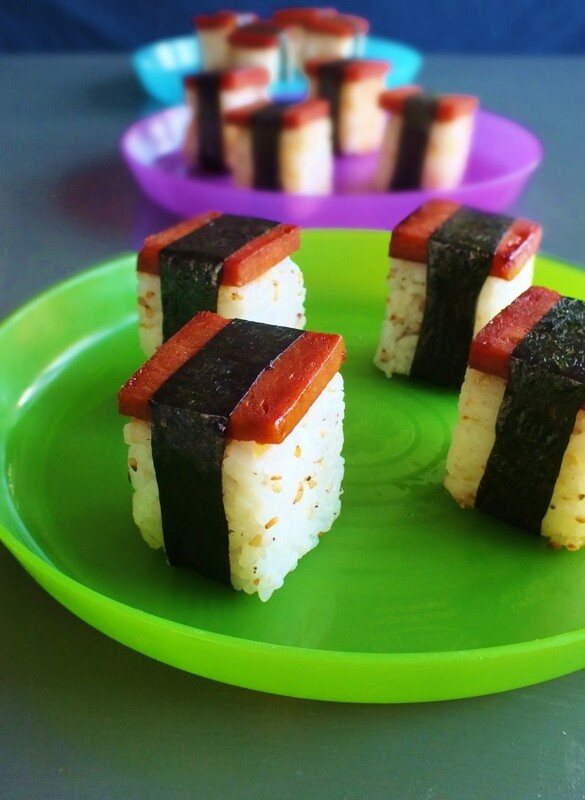 Turn over the repeat until all the rice cubes have a spam slice and a strip of nori wrapped around it. I hope this makes sense. Feel free to ask me questions if it doesn’t. This entry was posted in appetizer, cheap, Guam, Hawaiian, island food, savory and tagged appetizer, Guam, Hawaii, hawaiian, island food, spam, spam musubi, spam musubi bites. Bookmark the permalink. Never heard of spam before (in food terms off course!). Wonder where I can buy it in US? You can buy it in almost any grocery store. It’s by the canned tuna and canned meats. It’s full of salt, full of fat and full of flavor. It’s delicious fried in butter (yes) with some chunks of fresh butter and served for breakfast. In Hawaii, that would be served with white rice. I’m trying out these mini versions as appetizers for a Hawaiian dinner tonight.